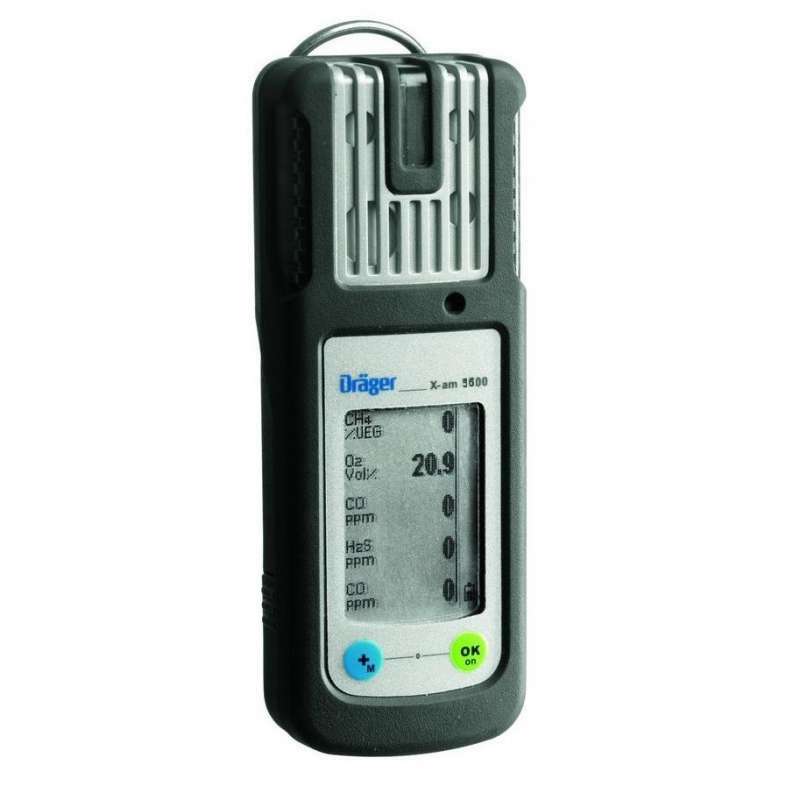 The Draeger X-am 5600 Personal Gas Monitor can measure up to 6 gases, ideal for personal monitoring solution for detecting and measuring of toxic. The Draeger X-am 5600 personal gas monitor features an infra red sensor and can measure up to 6 gases, it is compact, robust and water resistant as well as highly reliable. It is the ideal personal monitoring solution for the detection and measurement of toxic, combustible and explosive gases. IP67 compliant, lightweight, small in size and perfect for single hand operation in harsh industrial environments, featuring an integrated rubber boot it is a highly stable unit that is resistant to contamination. The sensors can be expected to perform for an average of eight years, needing calibration only on average once a year due to its advanced design thereby delivering high performance at a very low maintenance and operating cost. These state of the art infrared sensors are ideally suited to measuring both CO2 and combustible gases like propane, methane and ethylene with an operating range of 0 – 100 Vol.-% and a resolution of 0.01 vol %. The combination dual sensors allow for the reliable detection of Hydrogen as well as hydrocarbons. The Draeger X-am 5600 effectively combines the dual sensor signals to deliver unparalleled performance in the detection of ; SO2, H2, H2S, HCN, Cl2, CO, CO2,O2, NO, NO2, NH3, PH3, Odorant, COCl2, , Amine, organic and Ozone gases. Simple 2 button intuitive control panel, front side and upper gas inlets provide perfect gas detection even when placed inside the wearer's pocket. Other features include external pump option, combination operation with the Draeger X zone 5000 and 360° visible alarm and retro reflectors making the unit easy to find in low light or under water. All readings are available at a glance via the large display unit. Altogether a highly durable, accurate and fast sensing personal monitoring unit ideal for use in hazardous areas where concentrations of explosive or toxic gases may be present.